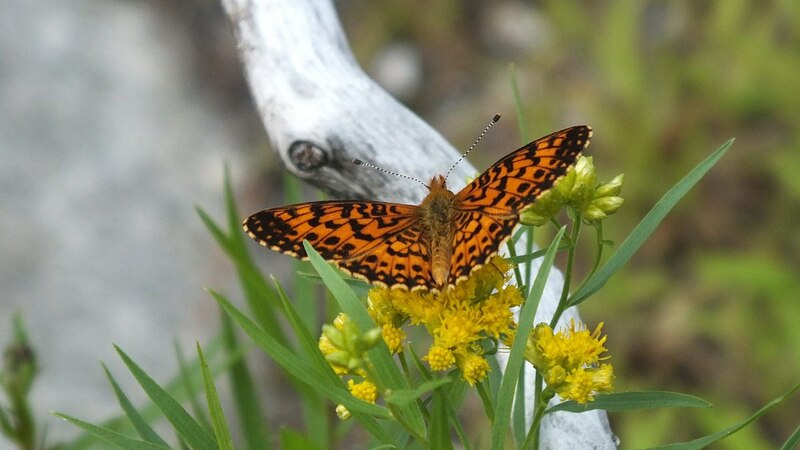 When Bob and I set off to explore the Atkinson Park Wetlands found at St. John’s Sideroad and Yonge Street in Aurora, Ontario, we expected to find ducks and herons, frogs and toads, but had not anticipated or planned on focusing on a number of interesting insects. 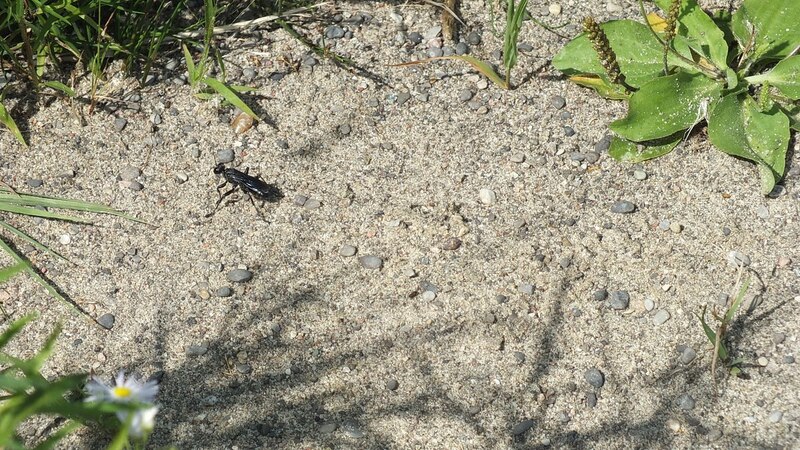 As I studied the frogs in the pond, Bob was absorbed in observing a curious black bug that turned out to be a Great Black Digger Wasp (Sphex pensylvanicus). 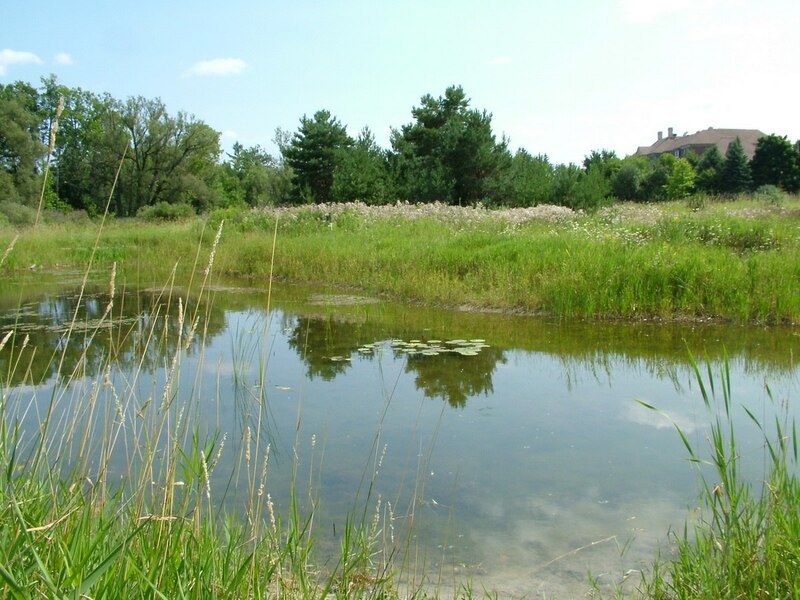 McKenzie Marsh is on the north side of St. John’s Sideroad and is a continuation of the Atkinson Park Wetlands on the south side of the same road. 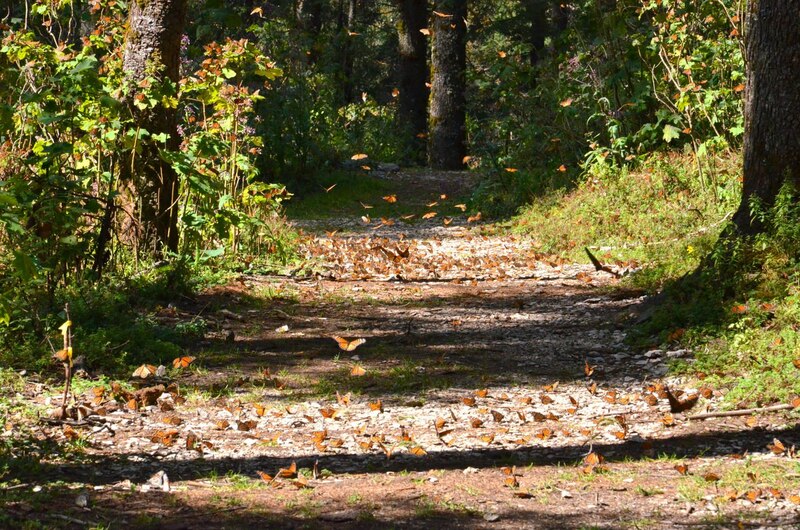 Both areas are set in the natural valley land of the Holland River and also encompass forests and meadows. The boardwalk and trail system at McKenzie Marsh are an extension of the regional Nokiidaa Trail. 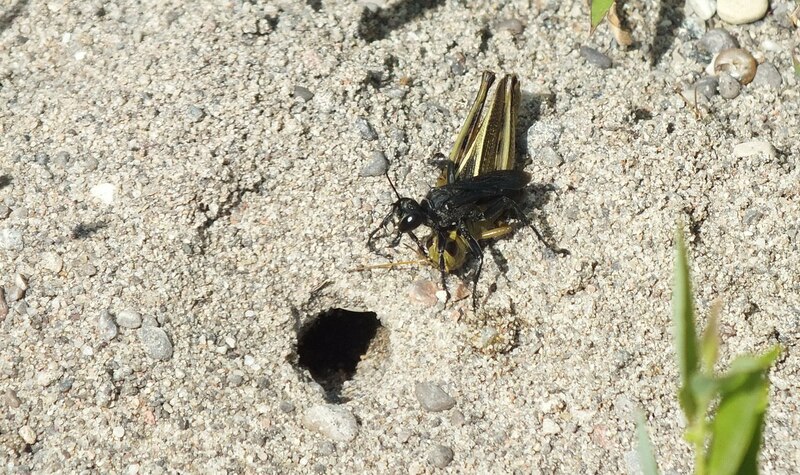 Bob called me over so I could see the Wasp as it began to build its nest hole. In typical fashion, the Wasp had selected an open area with no vegetation around the nest hole, and one that was fully exposed to the sun. 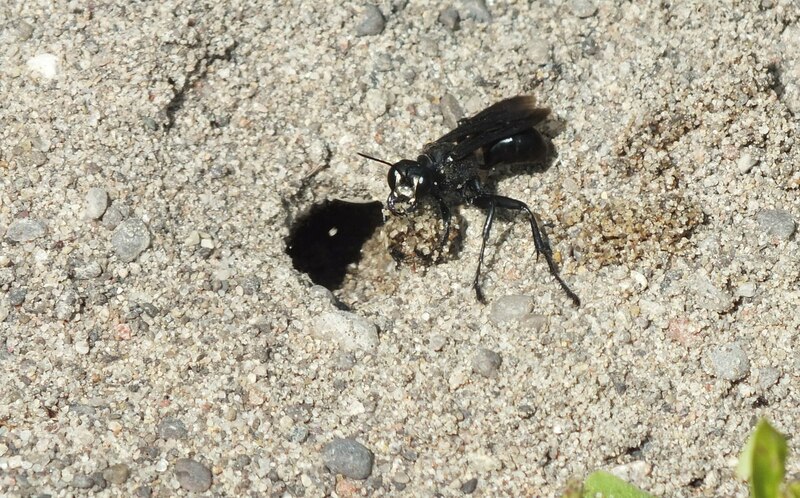 To begin excavating the vertical hole, the Digger Wasp cut the earth with its mandibles. It was fascinating to watch. Bob and I later identified this wasp as a Great Black Digger Wasp, differentiating it from the Great Golden Digger Wasp that has yellow wings, red legs and an abdomen that is partly red. The Great Black Digger Wasp has smoky wings with a body that is entirely black. 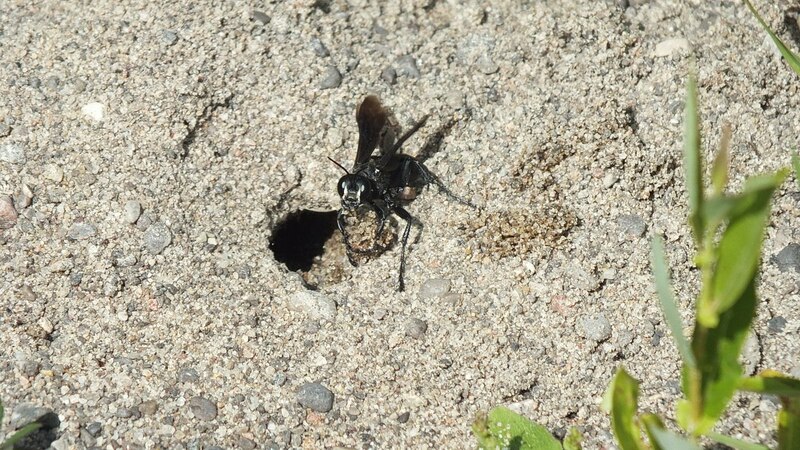 As Bob and I watched, this Digger Wasp repeatedly entered its hole and then returned to the surface with a ball of dirt a few moments later. The Wasp carried the dirt between its forelegs and head, and each time, it walked backwards about one inch (2.5 cm) away from the hole. Then, using the forelegs, the Wasp flipped the soil beneath its body and scattered it with the hindlegs. I figured it must be making way for more excavated material. It is only the adult females of this species that dig holes because they are building the underground nurseries. The main tunnel will have several tunnels branching off of it, and at the end of each secondary tunnel will be a small chamber. 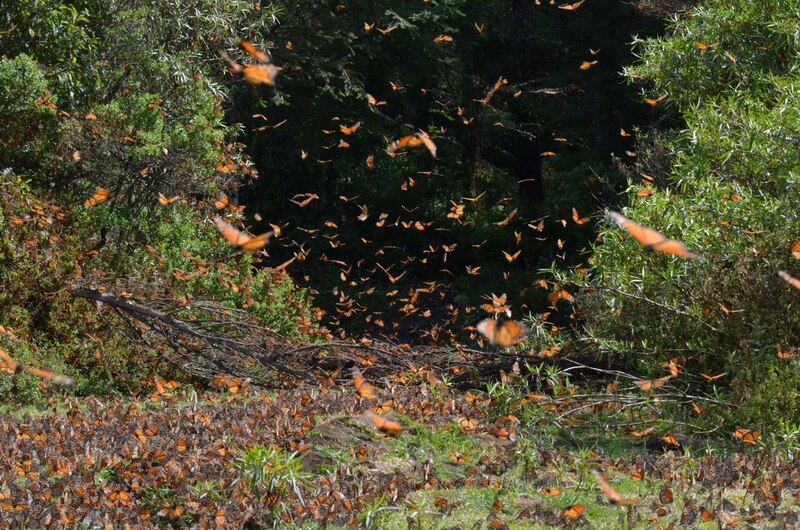 Into each chamber, the female will deposit one or more katydids or grasshoppers that will supply nourishment for one of her developing larvae. and then it made off towards the ground cover at the edge of the sandy clearing. Bob and I could not imagine where it was going in such a hurry, but the wasp was on a mission. Then, Bob saw a modicum of movement beneath some long blades of grass. 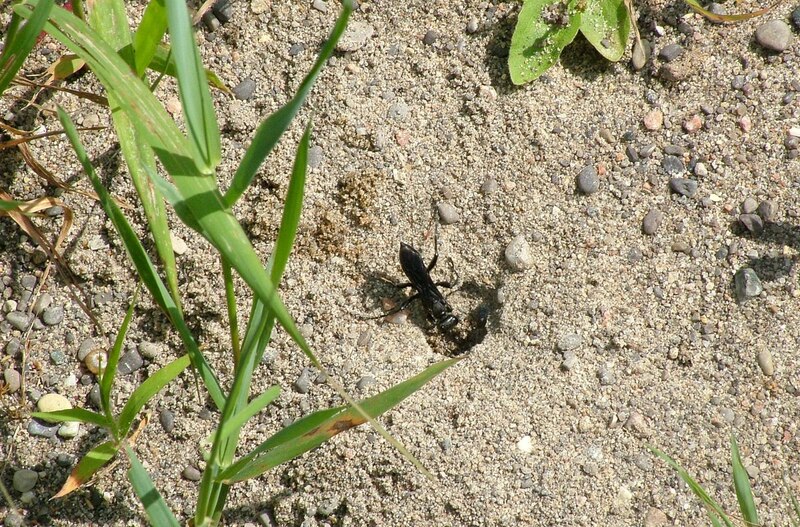 A huge grasshopper lay on the gravel, and the Great Black Digger Wasp was headed directly towards it. We put two and two together and realized that the Wasp was planning to retrieve its prey. The grasshopper was stationary because the Wasp had stung it no less than three times. Wasp toxin was injected into the neck and thorax of the grasshopper to permanently paralyze it, but even at that, the grasshopper could still move its mouth parts and antennae. In such a state, the grasshopper will be carried to the nest and deposited in one of the nursery chambers where it can remain alive for weeks. 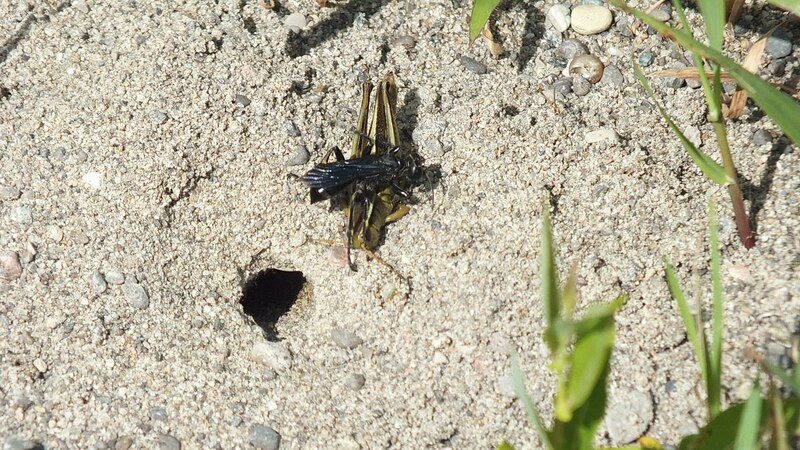 We then watched as the Digger Wasp transported the grasshopper to its nest hole. Each nursery chamber is stocked with numerous bodies before the female Wasp will secure an egg to the underside of one of them, and then she will leave the egg to hatch. 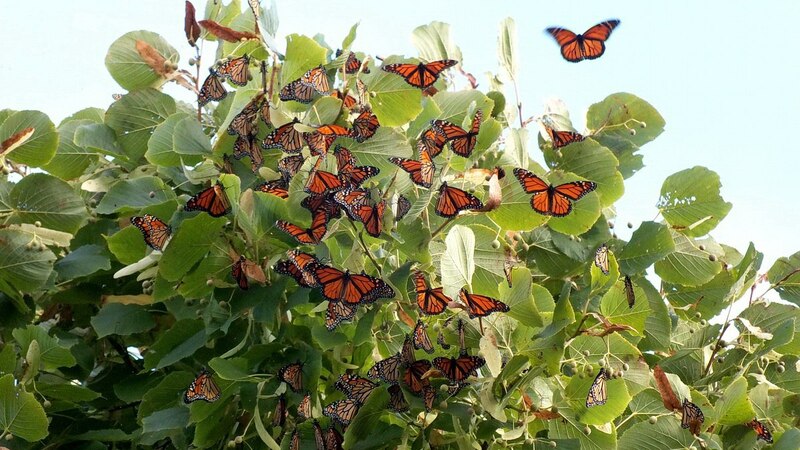 The larva, when hatched from the egg, will consume up to six live katydids or grasshoppers over the course of ten days, and then it will overwinter in the chamber and emerge next spring as an adult. It is the Wasp’s choice of prey that gives rise to its alternate name, Katydid Hunter, and the population of this species of wasp is partially influenced by the availability of its food supply. Also affecting the specie’s numbers is the theft of immobilized prey by certain species of birds. That practice is called kleptoparasitism, and the kleptoparasites are such birds as House Sparrows and Grey Catbirds. 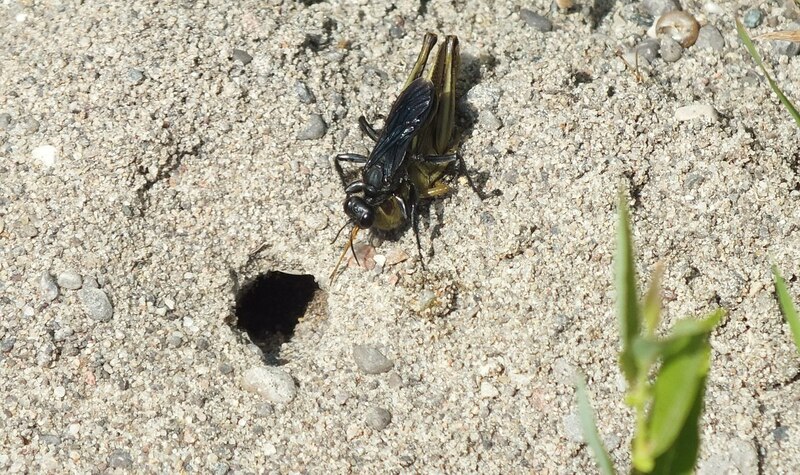 To prevent theft of the grasshopper, the Digger Wasp had stashed the anesthetized body a good distance from the nest hole, where it was camouflaged by the green grass. I thought that was pretty clever. 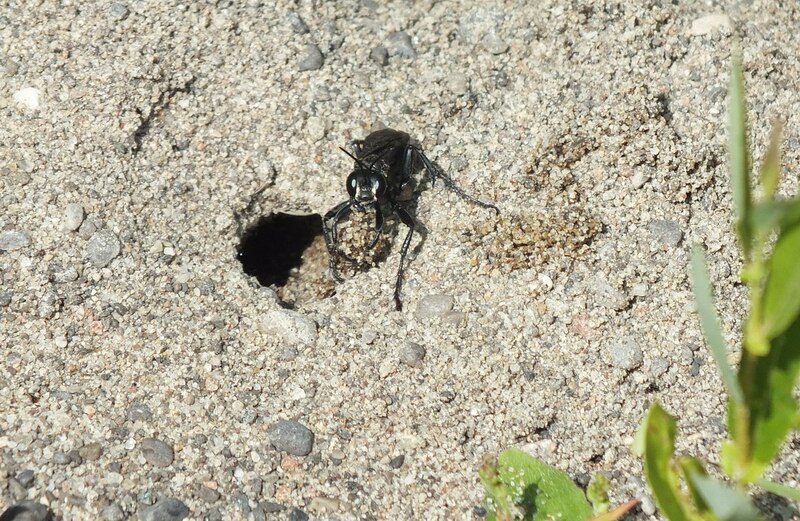 As we looked on, the Digger Wasp seemed to contemplate the best way of maneuvering its prey into the hole. The Wasp had dragged the grasshopper’s body by using her mandibles to grasp the grasshopper’s antennae as the grasshopper lay upside down. 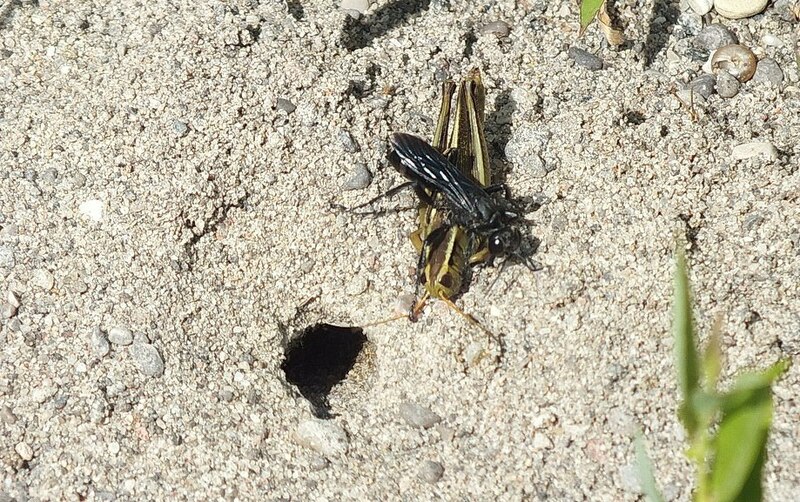 The hole looked just wide enough for the grasshopper to fit. 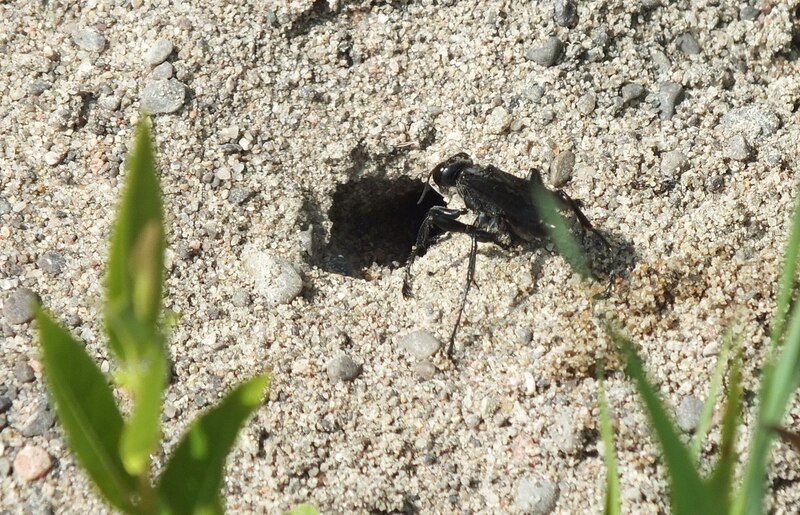 Considering that a female Great Black Digger Wasp will build as many as six nests in a summer, and each nest has multiple chambers stocked with numerous grasshoppers or katydids, we soon realized just how beneficial these wasps are to farmers. As an added bonus, they are a non-aggressive species. 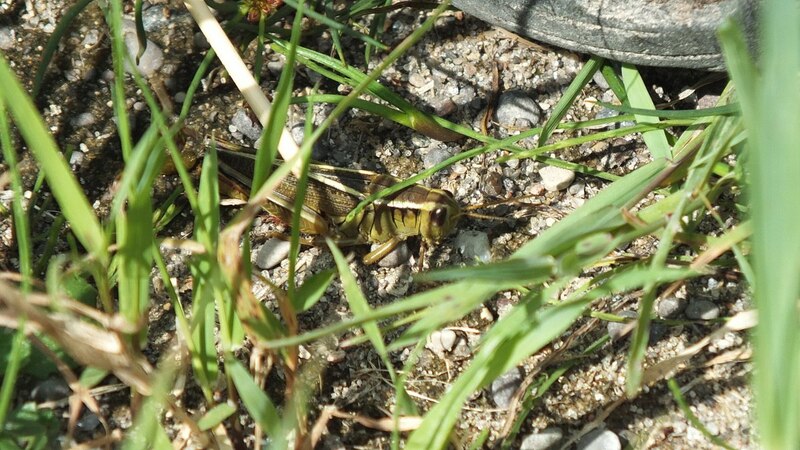 I was hoping to get a photo of the Wasp as it dragged the grasshopper below ground, but a momentary break in my concentration had led me to fail. This Great Black Digger Wasp that is a member of the family of wasps known as Thread-waisted Wasps was one interesting insect to study.